1 FUGERE, Henri, (French, 1872-1944): Dore Bronze and Ivory Figural Dual Inkstand: With mirrored back, 13 1/2''h x 9'' x 7 1/4'', incised signature. 6 KPM GILT OVERLAY DOLPHIN HANDLE VASE: Pure white porcelain overlay gilt metal. Greek key design on the base, gryphon on the body. The gilt porcelain handle in the form of dolphins. 15 1/4''h. Blue scepter mark underglaze. 7 PERIOD HUTSCHENREUTHER PAINTED PORCELAIN PLAQUE SIGNED WAGNER: 7 1/2'' x 5'', impressed markings verso to plaque, encased in period pierce carved and over painted gilded gesso floral and foliate frame with some minor damage, 16'' x 13''. 10A 19TH CENTURY ENGLISH INLAID DRESSER BOX: Mahogany and rosewood with shell form marquetry inlay on top of box, arrow and string inlay on sides and surrounding shell on top. Brass handles. Upholstered interior. 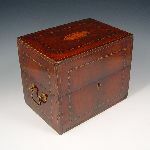 Box is from Woburn Abbey in Bedfordshire, England, and was presented as a gift to the consignor, a former employee of the Abbey. Measures 7 3/4'' high x 9 1/2'' x 6 3/4''. 21 ALABASTER CARVED PEDESTAL: Ribbed design with central carved collar with maple leaf design. Separates into 4 pieces for shipping and moving purposes. Measures 39'' h. x 12'' square base. 24 ZUMBUSCH, Ludwig von, (German, 1861-1927): Young girl with ball, OIL/Canvas, 18 1/2'' x 16'', gilded frame with wear, 23'' x 20''. 25 LEATHER TOP MAHOGANY PARTNERS DESK: Mid 20th. 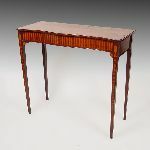 Double pedestal desk workable for two. Green leather top, Measures 30 1/2'' high x 73'' x 47''. For shipping purposes please note this desk breaks down into three parts. 27 19TH CENTURY COUNTRY SCENE PAINTING OF SWORDSMAN & MAIDEN: 7 1/4'' x 9'', unsigned, gilded period cove frame with minor wear, 15'' x 13''. 28 2 ARTS & CRAFTS KALO STERLING SERVING TRAYS: 2 pieces in oval form marked Hand Wrought at The Kalo Shop to include 1) Tray, monogrammed on base OUB, December 1, 1934. Measures 5/8'' high x 11'' x 6''. 2) Tray Monogrammed ''B'' at both ends on top, measures 3/4'' high x 10 5/8'' x 4 5/8''. Approx. 18 troy oz. 30 LARGE OIL/CB ''AURORA'' AFTER RENI: 35 1/2'' x 79'', circa 1900, period frame with wear and overpaint, 44'' x 86''. 34 AUSTRIAN ARMORIAL CHINA: Fischer & Mieg, Pirkenhammer, Ca. 1910-1945. Each piece with the coat of arms. Partial service of 29 pieces to include 8 reticulated plates (8 1/4''), 6 plates (9 1/2'' dia. ), 2 plates (8''dia. ), 4 demitasse cups and saucers, and 5 soup plates (9 1/2'' dia.). 38 GEORGE MAXIM NOUVEAU FIGURAL MAIDEN SPELTER LAMP: 26''h x 14'' x 11 1/2''. 7'' base dia. 44 19TH C COLOR LITHOGRAPH OF THE WEDDING OF GEORGE WASHINGTON AFTER STERNS, LITHOGRAPHED BY REGNIER: Sight size 18 1/4'' x 24'', gilded frame with wear, 26'' x 31 1/2''. 44A ENHANCED 19TH C PRINT PORTRAIT OF GEORGE WASHINGTON: Sight size 28 1/2'' x 20 1/2'', carved and silver gilt frame with minor wear, 33 1/2'' x 25 1/2''.